M-Language is easy to learn, even for those with close to zero knowledge of Excel formula language. It’s a great entry level drug, as you move from endorphins rush to endorphins rush. You are not overcharging your brain with M-Language. Give yourself a chance to gradually adapt to an entirely new subject. M-Language will do that service for you. Hit the Advanced Editor and start writing. No exotic IDEs, packages that need to be downloaded with help of weirdly looking scripts. None of the stuff that can potentially kill your beginner’s enthusiasm. Just hit the ground and run. You can start mashing up data after just a few hours of learning M-Language. Even concepts that sound esoteric to a regular business user’s ears are within reach. Fetching data through REST APIs? And then prepping it up for analytics? No problem. Start using M-Language to clean up your data, do meaningful and feasible work, or die trying to become a fully fledged Data Scientist in 6 months. 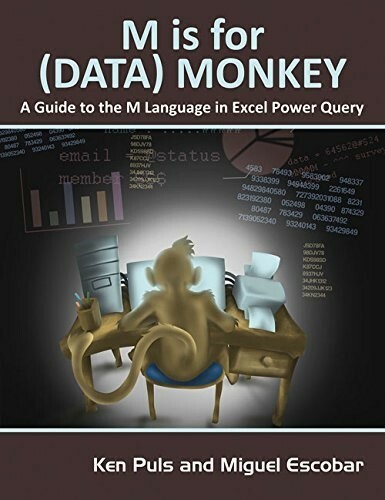 When I first discovered M-Language, I only found one truly great book dedicated to the subject of M-Language: “M is for (DATA) MONKEY” by Ken Plus and Miguel Escobar. M-Language allows you to mash up data without actually writing more than one or two lines of code here and there. You don’t need to learn writing code in M-Language, most of the work can be done through the UI. However, if you are keen on gaining a better understanding of how thigs work under the hood – it’s wort putting the time and effort in learning the fundamentals of this query language. It will “rewire” your brain, and you will eventually feel comfortable learning further programming languages. I was a bit scared when I wrote this series. By all means, I am not an expert and I am sure that my course is far from perfect. However, I believe the way we learn is changing: We can’t solely rely on experts (they will always be needed), but the importance of peer to peer learning is increasing. Second, just go ahead and read my series. I am very excited to hear back from you and get your honest feedback on my work. Thanks in advance! Excellent article. I have already shared with others. Thank you for sharing. I have been using Power Query (and ‘M’) for past two years. So powerful. It has changed how I handle data. Once you understand Power Query, move on to Power Pivot and the Data Model. They work together to enable complete financial solutions. Thank you so much, great to hear Doug!